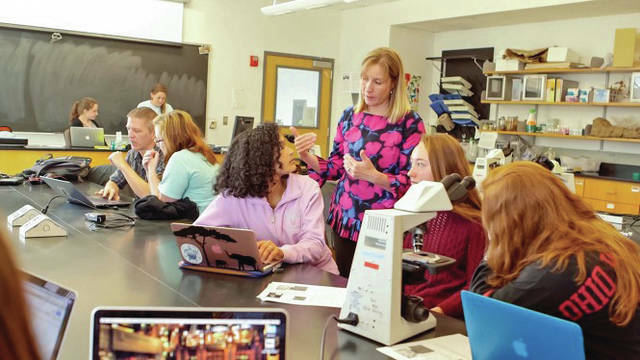 Ohio Wesleyan mathematics professor Craig Jackson, seated at left, and zoology professor Amy Downing, standing, team teach a class exploring how mathematical modeling can be used to better understand marine ecosystems. The university has received a grant from The Andrew W. Mellon Foundation to support more interdisciplinary courses. How about a class that mashes up marine biology and mathematics? Or one that combines music composition and computer science? Ohio Wesleyan University has received a $150,000 grant from The Andrew W. Mellon Foundation to support “enhancing interdisciplinarity” — an initiative by OWU professors to create classes that combine different academic areas with team teaching to deepen the educational experience for students. Ohio Wesleyan President Rock Jones, Ph.D., said understanding topics and issues from multiple academic perspectives helps students think creatively as they search for innovative, well-reasoned solutions. The 21-month Mellon Foundation grant, and the planning it supports, will continue to enhance The OWU Connection, Ohio Wesleyan’s signature student experience. The OWU Connection is the university’s guided, personalized, four-year degree path that combines interdisciplinary learning with international, hands-on internship, research, and study-abroad opportunities. University funding is available to support many of these connection experiences through venues including competitive Theory-to-Practice Grants. Learn more at www.owu.edu/owuconection. Biser said faculty who already have created team-taught courses are excited about the educational innovation and eager to expand the initiative using the Presidential Leadership Grant. Their OWU Connection course included a weeklong travel component, enabling students to study in class and on the island of St. John the properties of oceans, productivity and energy flow, plant and animal diversity, and human impacts on marine systems combined with a look at how mathematical models of biological phenomena can improve our understanding of marine ecosystems. Watch the professors and their students discuss the Travel-Learning Course at www.owu.edu/travel-learning. Learn more about enrolling at Ohio Wesleyan at www.owu.edu/admission.